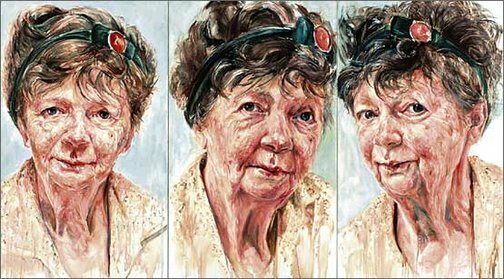 Australian artist Margaret Olley is probably one of the most painted faces in the history of Australian art. William Dobell’s 1949 Archibald Prize-winning painting of her remains one of the most popular portraits in the Art Gallery of NSW collection. When Danelle Bergstrom painted artist John Coburn for the Portia Geach Memorial Award in 2002, Olley was there at the opening and asked to meet her. “She was candid and rather wonderful about the painting. She can be quite up-front,” recalls Bergstrom. Towards the end of last year Bergstrom rang to ask if Olley would sit for her. She agreed and they began work in January. “She was very generous with her time,” says Bergstrom. “I approached the portrait of Margaret with an open mind. We spent time at her house where we chatted. I created a number of drawings and sketches and took a few snaps to assist in the search and concept for the painting. I always develop a number of canvases to explore the subject, working them up as a group. Margaret is a woman with a very strong personality and a very expressive face. I decided I wanted to focus on her face, which I find adorable. Using three images in one work became important in expressing time and movement in the final concept: our conversations together. The first panel is more distant, a warm, friendly greeting. The second is about dialogue and exchanging ideas. The third expresses an aspect of her cheeky personality. This appeared when we became more at ease with each other and the initial formality had gone.” Bergstrom has done eight portraits of Olley in all and is still working on them. Born in Sydney in 1957, Bergstrom studied at the Julian Ashton School of Art and then did a Bachelor of Art Education at the Alexander Mackie College of Advanced Education. She has exhibited in solo and group shows since 1980. She has been included in exhibitions including the Portia Geach Memorial Award, the Doug Moran Portrait Prize and the Kedumba Drawing Prize as well as the Archibald Prize.